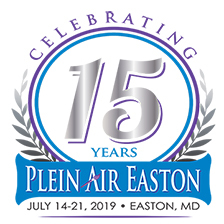 Plein Air Easton, the largest and most prestigious outdoor painting competition in the United States, is preparing for its 15th year this July. Each year PAE chooses a single person to evaluate hundreds of slides from plein air painters around the world to select the 58 artists who compete in Easton in July. This person becomes the judge for the event in the following year. Relying on a single juror ensures a clear and new curatorial perspective from year to year and has led to the discovery of fresh talent, not just for Easton but the larger plein air movement, as well. While this approach has been central to the Plein Air Easton’s vibrancy, it also means that the person selected as juror must have exceptional credentials and an interesting perspective. Marie Nuthall, PAE Coordinator for the Avalon Foundation, “We are thrilled to announce this year’s juror is Daniel H. Weiss, President and CEO of the Metropolitan Museum of Art,” Nuthall adds, “Having a juror and judge that are so highly esteemed in the art community speaks to the prestige of PAE itself and gives an exciting momentum going into our 15th year.” Prior to his current appointment, Weiss served as the 14th president of Haverford College,16th president of Lafayette College, and the Dean of the Zanvyl Krieger School of Arts & Sciences at the Johns Hopkins University, where he had previously served as Professor and Chair of the History of Art Department. Weiss is also an author who has written or edited five books and numerous articles on art of the Middle Ages and other topics. Weiss will review PAE applications following the January 25th deadline for online entries. The official announcement of this year’s 58 competition artists will be made on February 8, 2019. Weiss will also be presenting a ticketed talk the evening of July 18 in the Avalon Theatre and will be discussing his perspective behind the scenes at the MET. For additional information about the talk and the exclusive Meet and Greet following, check the online calendar. Special thanks to Troika Gallery for presenting this extraordinary opportunity! The competition judge for 2019 is Dr. David Levy; he served as last year’s juror and can be credited with inviting 22 brand new artists to last year’s competition. Says Levy about PAE’s juror choice, “Keep this up and you will put Plein Air Easton festival and competition on an extraordinary international platform. It will continue to get better and to become a model for the art world.” Levy served for 19 years as the CEO of the Parsons School of Design, then President and Director of the Corcoran Gallery of Art and College of Art and Design. In 2007, Levy became President of Cambridge Information Group (CIG) Education Group and of its graduate school, Sotheby’s Institute of Art. As judge of PAE, Levy will award all competition prizes during events taking place July 19-21 and will give a talk discussing his choices at the Judge’s Talk on Sunday, July 21 at the Library at the Armory. All PAE events are listed online at pleinaireaston.com, and new content will be added continuously in the months to come. Plein Air Easton has been a leader and catalyst in the development of the modern plein air movement over the past 15 years. Many of the most important trends started in Easton and the push for ever higher standards in plein air painting have been forged in Easton through the intense competition among the top painters in the field. The Avalon Foundation is confident that its selection of Daniel Weiss as the 2019 event juror will push the bar for even more innovation and excellence in plein air events the world over. Plein Air Easton is the work of the Avalon Foundation, a nonprofit organization whose mission is to foster a strong community on the Eastern Shore by creating accessible, uplifting arts, education, and cultural experiences that appeal to the interests of a diverse population and to ensure the long term viability of the historic Avalon Theatre. This event is supported by Talbot County Arts Council, donations from corporations, small businesses, media outlets, Friends of Plein Air Easton, and strong community support. All of which have helped Plein Air Easton become the premier plein air art festival in the country.